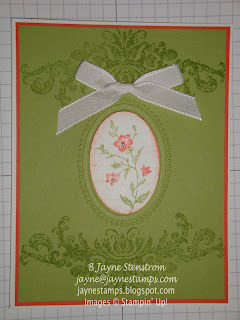 Today I am showing you the cards that we made at our Chalk-a-holics meeting last Friday. 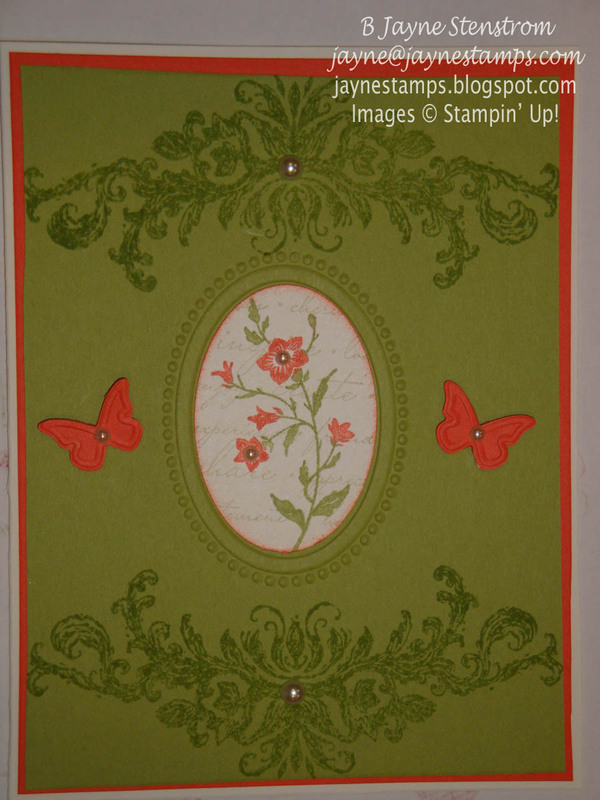 Getting together with friends to stamp is like enjoying a beautiful bouquet of flowers. The different variety and colors all work together to create something to be enjoyed for a long time. I love the colors of this first card! It was totally CASE-d from another blog by a lady named Heather C. We stamped it a little differently than she did, but it's the same colors and layout. You can view her original post with this card HERE. The stamp set is Raining Flowers and the colors are Melon Mambo, Tangerine Tango, and Lucky Limeade. This is a gate-fold card and opens in the middle. This was a great way to introduce everyone to the new Simply Scored Scoring Tool that will be available September 1 in the Holiday Mini Catalog. You are going to love Stampin' Up! 's scoring tool. It's so easy to use. I can't wait to show it to you! 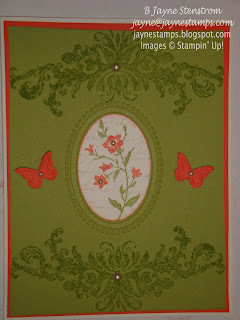 The next card came about because I wanted to use the Designer Frames Textured Impressions Embossing Folders Set. I had seen a video on how to use these and I thought that the gals in my group would like to learn some tips on using these. So I started with Pear Pizzazz cardstock and the oval designer frame. So far, so good. Then I needed some kind of image on the background, so I used the Best Friends Forever stamp set with the Stamp-a-ma-jig to line up the images above and below the oval. Hmmm... now something for the center oval. 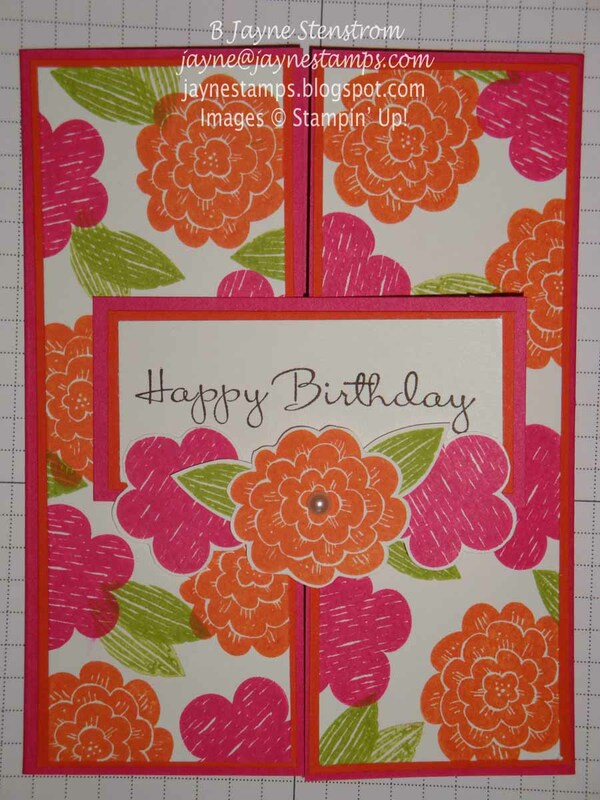 So I pulled out the Charming stamp set and inked the flower image with Pear Pizzazz and Calypso Coral markers and punched it out with the Extra-large Oval Punch (which fits perfectly in the oval shape made by the embossing folder). I added some Basic Pearls to the center of the flowers. Then I started to lose my mojo. I originally had a piece of 5/8" Whisper White Satin Ribbon going horizontally across the card under the oval plus the bow on top. I wasn't happy with it, but decided that we would get creative at the meeting to improve on the card. I didn't take a picture of that original card because I started pulling everything apart before I thought about a picture. I still wasn't quite happy with it, but the other gals got working with their cards to see what they could come up with. We decided that the "winner" was Emily who cut out the butterflies with the Beautiful Wings embosslit and put them on either side of the oval. She also added larger pearls to the top and bottom images. So, what would you do to improve on this card? We all agreed that maybe the Pear Pizzazz images from Best Friends Forever should have been softer - maybe stamped with VersaMark ink. But we all had fun coming up with different ideas on how to improve this card. Sometimes it helps to have others to bounce ideas off of when you're in a creative block.